Background: Mucoepidermoid carcinoma (MEC) is a malignant salivary gland neoplasm with extreme morphologic heterogeneity and hence rendering a definitive fine needle aspiration cytology (FNAC) diagnosis of this neoplasm is really challenging. The present study was undertaken to elucidate the cytological features of MEC and explore the diagnostic accuracy and pitfalls by comparing with subsequent histopathology. Materials and Methods: The present study was conducted over a period of 2 years wherein we obtained six histopathologically confirmed cases of MEC. These patients were initially subjected to FNAC. The cytologic features studied included presence of mucous cells, intermediate cells, and squamous cells. Presence of background mucinous material was also noted. The cytological features were compared with the subsequent histopathology. Results: Of the 6 cases of MEC, a definite cytological diagnosis was possible only in 2 cases. Of the remaining 4 cases, 2 cases were broadly diagnosed in cytology as neoplasm with cystic degeneration and 2 cases were underdiagnosed as pleomorphic adenoma. Conclusions: A satisfactory aspirate with all three types of cells; mucous, intermediate and squamous cells may not be obtained in all cases of MEC for providing a definite diagnosis. Hence, a good clinicoradiological correlation, a high index of suspicion and repeated aspirations especially in cystic lesions may be particularly helpful in difficult cases. In addition, while dealing with mucinous cystic lesions with low cellularity, the importance of early excision should be communicated to the clinician since the possibility of low-grade MEC cannot be excluded. The present study was undertaken to elucidate the cytomorphological features of MEC and explore the diagnostic accuracy and pitfalls by comparing with subsequent histopathology. The study cohort included 60 cases of salivary gland lesions that where referred to the cytology laboratory of our institute over a 2 years period from January 2007 to December 2008. They were subjected to FNAC after recording the relevant clinical details. Among these, 6 cases were MEC. Fine needle aspiration cytology was performed using a 23 gauge needle attached to a 5 mL syringe. Wet smears fixed in 95% isopropyl alcohol were taken up for staining by Papaniclaou (Pap) method. Dry smears were also prepared and stained using May-Grünwald-Giemsa (MGG) stain. The cytologic features studied included presence of mucous cells, intermediate cells, and squamous cells. Presence of background mucinous material was also noted which appears as blue violet in MGG and pale blue in Pap stained smears. On subsequent follow-up, these patients underwent surgery, and the specimens were sent to the histopathology laboratory. The specimens were fixed in 10% formalin. Paraffin blocks were made, and Hematoxylin and Eosin stained sections were prepared. The cases were grouped into low, intermediate and high grade based on the standard grading system for MEC. Special stain for mucin (mucicarmine, PAS-D or alcian blue at pH 2.5) was done in relevant cases. The cytological diagnosis was compared to the histopathological diagnosis. Cases that were underdiagnosed in cytology were re-evaluated to assess the diagnostic pitfalls. In the present study, there were 6 histologically confirmed cases of MEC. The age range affected was 25-50 years. Two were males, and four were females. The parotid gland was the most common site involved (5 cases) with the left side being more commonly affected and one case occurred in the palate. The appearance of MEC in FNA smears was found to be highly variable and posed difficulties in diagnosis. Of the 6 histologically proven cases, 2 were correctly diagnosed in FNA. Smears showed variable cellularity with mucin-secreting vacuolated cells, intermediate cells, and a few squamous cells. Mucinous material was seen in the background [Figure 1]. Two cases of MEC were broadly diagnosed in cytology as neoplasm with cystic degeneration due to the decreased cellularity of the smears despite repeated aspirations and failure to demonstrate definitely all the three cell types (intermediate, squamous and mucin-secreting cells). However, excision was advised since the possibility of low-grade MEC could not be excluded. Two histologically proven cases of MEC were underdiagnosed as pleomorphic adenoma in cytology. Review of the smears in these cases showed epithelial cells in clusters. Some cells showed squamoid features that were interpreted as metaplastic squamous cells that are commonly seen in pleomorphic adenoma. However, definite vacuolated cells were not seen even after an extensive search. Chondromyxoid material, typical of pleomorphic adenoma was also not seen. The most common malignant tumor in this study was MEC. Six cases were diagnosed on histopathology that included 4 low-grade tumors and 2 intermediate grade tumors. Of the 6 cases, 2 cases were correctly diagnosed in FNAC. Smears showed intermediate cells, mucin-secreting vacuolated cells and a few squamous cells in a dirty background containing mucus [Figure 2]. Pitts et al. reported a diagnostic accuracy of 50% for MEC in their study. In two cases of low-grade MEC [Figure 3]a and [Figure 3]b, a diagnosis of neoplasm with cystic degeneration was made in cytology. This could be attributed to the decreased overall cellularity of the smears and failure to demonstrate definitely all the three cell types. According to Orell et al.,  a definitive diagnosis of MEC requires the coexistence in smears of cells showing squamous differentiation and of mucin-secreting cells. Unequivocal evidence of both is not always found, especially in cystic tumors, wherein only a tentative diagnosis can be offered. 1. Proportion of cystic and solid components. 2. Proportion of different cell types mucin-secreting, intermediate and squamous cells. 3. Presence and degree of cytomorphologic atypia. Recently ancilliary studies like reverse transcription polymerase chain reaction (RT-PCR) and fluorescent in situ hybridization (FISH) have found to be useful in the diagnosis of morphologically ambiguous cases of MEC. A distinct translocation t(11;19)(q21;p13) and the resultant MEC translocated 1-mastermind like gene family) (MECT1-MAML2) fusion transcript have been detected in 38-81% of MEC cases. In addition, studies indicate that fusion-positive tumors behave in a less aggressive fashion with a significantly lower risk of local recurrence, metastases, or tumor-related death compared to fusion-negative ones. The MECT1-MAML2 fusion transcript has been found in MECs with variant translocations such as t(11;17) and t(11;13), as well as in tumors with apparently normal karyotypes and trisomies. The most frequently encountered trisomies were +7, +8, and +X. In the case of pleomorphic adenoma, pleomorphic adenoma gene-1 and high motility group 2 containing fusion genes serve as diagnostic markers that can be detected using RT-PCR or FISH. Fine needle aspiration cytology has an important role in the preoperative evaluation and categorization of various salivary gland lesions. Proper sampling of lesions and adequate cellularity of the smears are the prerequisites for an accurate diagnosis. In cases where all the three components are seen, a definite cytologic diagnosis of MEC should be made. Regarding the cytologic evaluation of cystic lesions in particular, repeated aspirations and centrifugation of the smears are very useful measures to increase the cell yield. In addition, while dealing with mucinous cystic lesions with low cellularity, the importance of early excision should be communicated to the clinician since the possibility of low-grade MEC cannot be excluded. Stewart CJ, MacKenzie K, McGarry GW, Mowat A. Fine-needle aspiration cytology of salivary gland: A review of 341 cases. 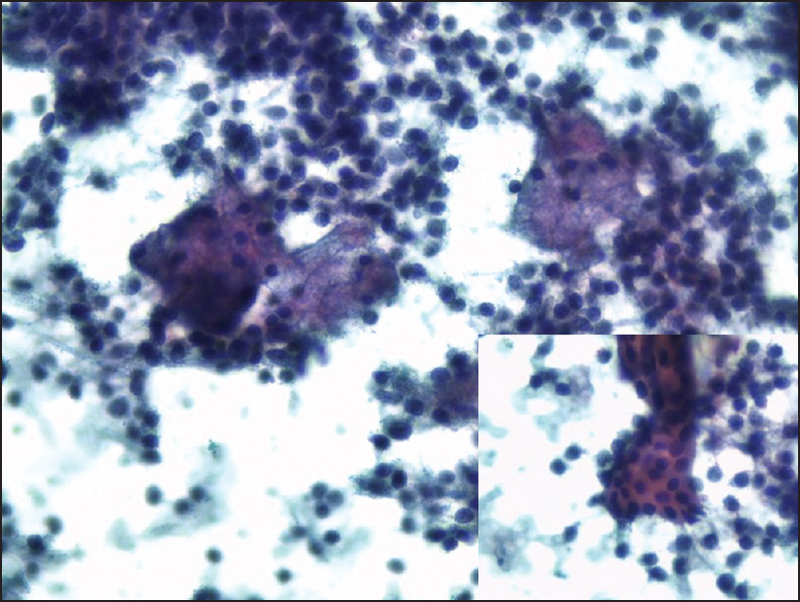 Diagn Cytopathol 2000;22:139-46. Seethala RR, LiVolsi VA, Baloch ZW. Relative accuracy of fine-needle aspiration and frozen section in the diagnosis of lesions of the parotid gland. Head Neck 2005;27:217-23. Naderpour M, Shahidi N, Daryani A, Nejad K. Evaluation of diagnostic fine needle aspiration cytology in parotid gland masses. Internet J Head Neck Surg 2008;2:9. Edwards PC, Wasserman P. Evaluation of cystic salivary gland lesions by fine needle aspiration: An analysis of 21 cases. Acta Cytol 2005;49:489-94. Frable MA, Frable WJ. Fine-needle aspiration biopsy of salivary glands. Laryngoscope 1991;101:245-9. Mavec P, Eneroth CM, Franzen S, Moberger G, Zajicek J. Aspiration biopsy of salivary gland tumours. I. Correlation of cytologic reports from 652 aspiration biopsies with clinical and histologic findings. Acta Otolaryngol 1964;58:471-84. Orell SR, Sterrett GF, Whitaker D, Klijanienko J. Head and neck; salivary glands. In: Orell SR, Sterrett GF, Whitaker D, editors. Fine Needle Aspiration Cytology. 4 th ed. Edinburgh: Churchill Livingstone-Elsevier; 2005. p. 53-69. Pitts DB, Hilsinger RL Jr, Karandy E, Ross JC, Caro JE. Fine-needle aspiration in the diagnosis of salivary gland disorders in the community hospital setting. Arch Otolaryngol Head Neck Surg 1992;118:479-82. Kotwal M, Gaikwad S, Patil R, Munshi M, Bobhate S. FNAC of salivary gland - A useful tool in preoperative diagnosis or a cytopathogist's riddle? J Cytol 2007;24:85-8. Kline TS, Merriam JM, Shapshay SM. 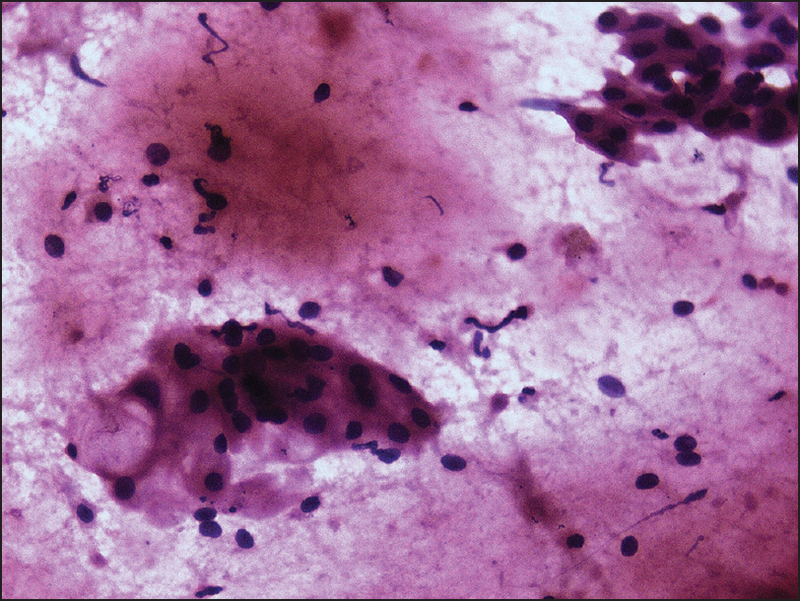 Aspiration biopsy cytology of the salivary gland. Am J Clin Pathol 1981;76:263-9. Li S, Baloch ZW, Tomaszewski JE, Li Volsi VA. Worrisome histologic alterations following fine-needle aspiration of benign parotid lesions. Arch Pathol Lab Med 2000;124:87-91. Auclair PL, Ellis GL. Mucoepidermoid carcinoma. In: Ellis GL, Auclair PL, Gnepp DR, editors. Surgical Pathology of the Salivary Glands. Philadelphia: WB Saunders; 1991. p. 279-86. Mahesh KU, Potekar RM, Saurabh S. Cytological diagnosis of mucoepidermoid carcinoma of parotid - A diagnostic dilemma. Int J Med Sci Public Health 2013;2:462-4. Christe A, Waldherr C, Hallett R, Zbaeren P, Thoeny H. MR imaging of parotid tumors: Typical lesion characteristics in MR imaging improve discrimination between benign and malignant disease. AJNR Am J Neuroradiol 2011;32:1202-7.